The rainy season is here, with its associated common ailments such as cold and cough. Ginger is a useful antibiotic and a good protection against cold and flu. ‘Zingiber officinale’ is one of about 1400 species in the Zingiberaceae family of herbs. Native of Asia, ginger grows well in the tropical countries of the world. Ginger is widely cultivated in West Africa, especially in Nigeria and Sierra Leone. Of the over 1400 species of aromatic herbs in the Zingiberaceae family, ginger is the most powerful and the most well-known. The perennial tuberous rhizome is mistakenly referred to as root. Just as one does not call yam tuber root, so also one should not call the ginger rhizome ‘root’. Because of differing climatic conditions, each variety of Zingiber has its own unique aroma and flavour. Ginger grown in China is often mild in flavour while ginger in Africa is hot and peppery. Jamaican ginger often has very strong aroma. The botanical name for ginger was given by a Swedish botanist named Linnaeus. It comes from the Sankrist word ‘singabera’, which means ‘shaped like a horn’. The term officinale simply means that it is commonly available. Indeed, ginger is a common feature in the cooking pot of cooks as well as the concoction jars of herbalists. In China it is called sheng jian, where it was used as long 5000 years ago, that is, 3000 years before Christ was born. Ginger was mentioned in Emperor Shen Hung’s ‘Pen Tsao Ching’ [The Classic book of Herbs] which he wrote in 5000 BCE. Ginger was also mentioned in the Ayurveda, the Hindu manual of medicine written in the fifth century BCE. The Roman physician Dioscorides, mentioned ginger in his book: ‘De materia medica’. In the Koran, it is written that among the richest in heaven ‘are passed vessels of silver and goblets of glass…and a cup, the admixture of which is Ginger’. In England in the middle ages, a pound of ginger spice was held to be equal in value to a sheep and can only be afforded by the rich. Take a walk to the nearby local market and asked for ginger. It is always readily available in the market. The fresh ginger can last up to two months in a refrigerator. The dried powdered ginger can last up to one year. The dried whole ginger can last up to two years. It is not advisable to store ginger in the refrigerator. It is better to dry it and grind it into powder. Some people use powdered ginger to season their food. They simple sprinkle a teaspoon of powdered ginger on their food. This adds taste to the food as well as strengthens the system. Ginger contains Phenols, resins and many volatile oils, such as borneol, camphere, citral, eucalyptol, linaol, and zingiberol. Ginger is rich in carbohydrates, proteins, minerals and vitamins. 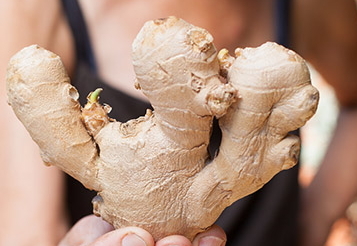 In middle- age Europe, ginger was an important food and medicine. Ginger’s warming, aromatic properties have long been used to treat colds and flu. Ginger promotes a beneficial sweating that helps to eliminate toxins from the system and may be taken as a tea with honey and lemon at the first sign of a chill. The fresh or dried also stimulates the circulation and is helpful for cold hands and feet. It aids the digestion of food. It has a calming effect on the digestive system. It is not possible to list all the medicinal effects of ginger on the body, because ginger affects most of the body’s organs.